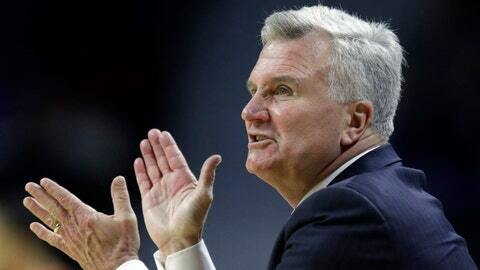 Kansas State announced an extension Friday with coach Bruce Weber that could keep him in Manhattan through 2022-23. It’s also a nice reward considering Weber was thought to be on the hot seat a couple of years ago, before landing a new two-year contract last fall that provided some measure of comfort. The extension turns Weber’s contract into a five-year deal with a salary of $2.5 million this season, and an additional $100,000 for each remaining season. That means Weber will earn $2.9 million if he makes it to the final year of the contract. The new deal also includes an increase in Weber’s buyout. The school would owe him $2.5 million if he’s fired before April 30, 2019, with an additional $100,000 the following year. The buyout would drop to $2 million in 2021, $1 million the next year and $500,000 before the final year.